Boulder, Colorado - Retired West Virginia Senator Jay Rockefeller, himself the scion of a long and storied family tree, is among those to whom the National Institute of Standards and Technology has bestowed a scion of a different sort: a clone of an apple tree that was growing next to the house in Lincolnshire, England, where Isaac Newton was born in 1643. The tree, a variety variously called the “Flower” or “Pride” or “Beauty” of Kent, fell over around 1814, but it was propped up by locals until it was again knocked down during a severe thunderstorm around 1820 … and still the tenacious tree managed to re-root itself and continues to stand, guarded by a short wicker fence, today. Legend has it that the idea of gravity came to young Isaac when he was struck on the head by a falling apple while reclining under the tree. Newton himself said that he simply saw one of its apples fall to the ground while on furlough from Cambridge University, which was closed due to the Great Plague of London in 1665-66. Seeing how the apple was drawn toward the center of the Earth, Newton began to wonder if the same force that drew upon the apple also drew upon the moon and the planets. It was from there that he began to untangle the problem of gravity, resulting finally in his famous Principia, the first edition of which was published in 1687. And like history often is, the story of how NIST came into possession of a clone of this famous tree is as tangled as its searching roots. Weathered and withered, but still producing leaves and apples, the tree that Newton contemplated is now more than 350 years old. 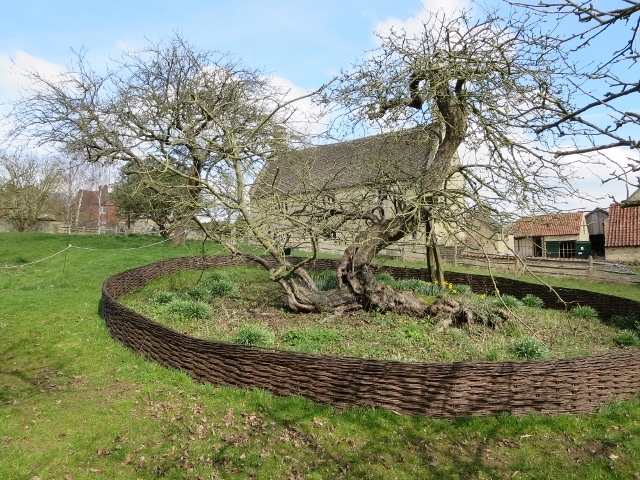 What seems mostly certain is that either the Turnor family, who took over the house after the Newtons, or the first Earl of Brownlow, John Cust, or one of his underlings, took cuttings from the only apple tree in the vicinity of Newton’s home, Woolsthorpe Manor, around when the tree blew down the second time. Those cuttings were nurtured in the kitchen garden of the earl’s manor in nearby Belton, where they flourished until cuttings were taken to the East Malling Research Station and Kew Gardens just before the outbreak of World War II in 1939. Shockingly, two or more of the trees from the East Malling stock were exported to the U.S. during the height of World War II in 1943-44. Clarence A. Reed, an employee of the U.S. Department of Agriculture’s Henry A. Wallace Beltsville Agricultural Research Center in Beltsville, Maryland, was likely the person who arranged to have these trees brought to him through hostile, submarine-infested waters. One tree was planted at William Penn’s Pennsylvania estate, Pennsbury Manor. Reed took another of the imported Newton trees and planted it in Takoma Park, Maryland, around 1947. The inestimable Sir Isaac Newton circa 1689. Eight years later, Louis Essen of the U.K.'s National Physical Laboratory (NPL) built the first atomic clock accurate enough to be used as a time interval standard. Around that same time, NIST researcher Irving Gardner was visiting NPL as part of his effort to more accurately measure the gravitational constant, affectionately known as “Big G.” NPL had acquired a Newton apple tree from Kew Gardens in the 1940s, and Gardner became enthralled with the idea of having one on the NIST campus as well. Upon his return to the U.S., Gardner planted the seed among his colleagues about the possibility of acquiring a clone of the NPL tree for the NIST campus, which was then called the National Bureau of Standards (NBS) and located in Washington, D.C., on the site of what is today the campus of the University of the District of Columbia. Before arrangements to have a tree sent over from England were made, “someone” remembered there was a Newton apple tree in Takoma Park. A search party was organized, a tree located, four grafts taken, and one planted next to the NIST building where the constant of gravity was being re-determined in 1957. The occasion was one of much fanfare, at least among the employees and a student tour group that happened to be there that day. This tree was initially regarded as genuine. But sometime shortly thereafter, NIST Director Allen Astin inspected the pear-shaped fruit of the tree taken from Takoma Park, and, skeptical as scientists are apt to be, wondered aloud about the tree’s heredity. At this, another request for scions from the original Woolsthorpe-Brownlow-East Malling stock were sent, and new saplings procured in 1960. They were nurtured at the Beltsville, Maryland, agricultural research center before one was planted on the new NIST campus in Gaithersburg in 1966 or 1967, where it stands, listing only slightly, to this day. The tree at Pennsbury died in 1988 and was replaced with a graft from the NIST Gaithersburg tree, so Pennsbury now has a “true” descendant of the Woolsthorpe-Brownlow-East Malling stock. I say “true” because the clone of the 1957 East Malling-Pennsbury-Takoma Park tree that was planted at NIST’s Boulder, Colorado, laboratory, the same progeny that Astin wondered aloud about, proved to be an imposter—an ornamental crabapple tree—and was replaced with a cloned sapling from Gaithersburg in 1978. This implies that the tree taken from Takoma Park and planted on NIST's original campus was not genuine. Reed, being an expert in such things, would not likely have made such an error, so the mixup is more plausibly due to the fact that NIST does not employ dendrologists. We may never know exactly what transpired. Despite all the intrigue surrounding this tree’s family … tree, the trees now under NIST’s control are in fact the real thing. There is even a secret grove of them growing somewhere on NIST’s Gaithersburg campus that are given out as gifts to assorted luminaries. Recipients of NIST’s Newton apple tree clones include Sen. Rockefeller, who donated his tree to West Virginia University; former Undersecretary of Commerce Ed Vetter, who donated his to the Massachusetts Institute of Technology; former NIST Director Pat Gallagher, who donated his to the University of Pittsburgh; former Secretary of Commerce Donald Evans, who donated his to the University of Texas; and co-founding father of the internet (and former chair of the NIST Visiting Committee on Advanced Technology) Vinton Cerf, who donated his to Stanford University. As the plaque near the NIST Gaithersburg tree reads, “Science has its traditions as well as its frontiers.” I hope this tradition will continue far into the future and that the descendants of this humble hardwood will continue to inspire scientific discovery at NIST and everywhere its scions have set down roots.